This is not the first time members of the White Helmets have been caught on video helping Al-Qaeda. The White Helmets, a Nobel Peace Prize nominated group that has been painted as a selfless “humanitarian group” by the media, was once again caught on video helping the same terrorist group that is hurting the civilians they claim to protect. However, a recent post from a Twitter user by the name of “Walid” painted the White Helmets in a very different light. 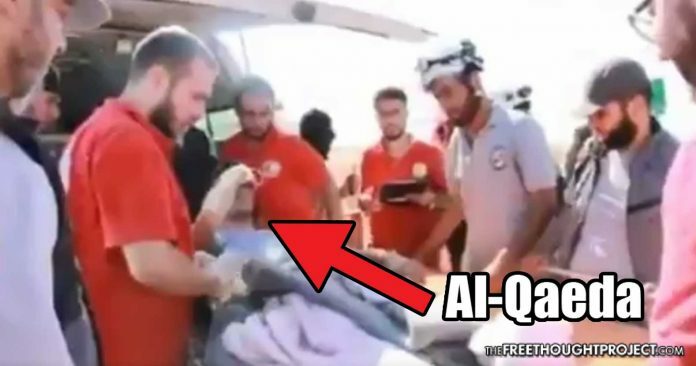 The video appears to show the famed White Helmets taking care of injured Al-Qaeda fighters who were recently wounded on the Syrian battlefront. This is just the latest in a series of videos, which has served as evidence that the White Helmets are not what they appear. As it stands, the White Helmets are heavily funded by the U.S. and the U.K., as well as many other international entities. That may be the reason they always work in rebel held areas of the greater Syrian conflict. The WH serve as a de facto propaganda wing of the West to sway public opinion into supporting regime change in Syria. The fact the mainstream media did not immediately report the truth serves to illustrate—as Wikileaks DNC emails revealed—that they are in the U.S. war machine’s back pocket. With the latest Twitter revelation, one can draw their own conclusions of whether or not the group is simply giving humanitarian aid, or whether its members are taking part in the Syrian/Iraqi genocide. According to Salon, they’re already beheading people on film. So much for that impartial humanitarian aid!